Summer came screeching to a halt and I realized I hadn’t roasted as many veggies on the wood fire grill as I had last year. I ran off to the Portage Park Farmer’s Market to remedy the situation stat! There really is nothing like a roasted or grilled veggie and when you kick it up a notch with some wood coals or wood chips you’re in for a whole new level of flavor.. This salad reminded us of the crazy sandwiches we have at the open air market in Antwerp every time we visit Frank. Some day he’ll share that story/sandwich with us, I feel it! A girl can dream, now can’t she? This is an easy recipe that can be interpreted any way you see fit Get out there and fire up your grill and don’t miss out on one minute of this fantastic weather. This is what I used, but feel free to add more/less/different veggies. Lightly coat with olive oil then grill on both sides. 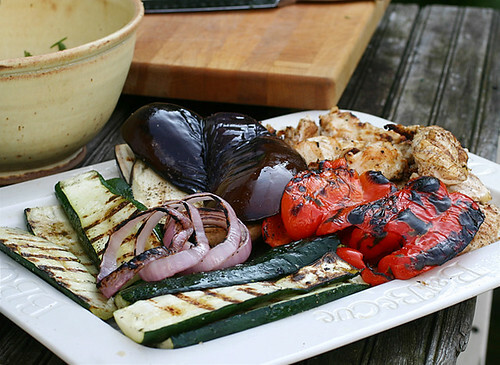 Grilling time varies according to veggie. This is perfect to use up vegetables I’m gathering from the garden before frost…..right down to the handfulls of herbs! P.S. Your pictures are beautiful!!! CONGRATS ON MAKING IT TO THE NEXT FOODBUZZ ROUND! Oh Mary that is one beautiful salad. A nice hunk of bread and a big bowl of this, heaven for sure! Congrats on the progression, best of luck to you! Now that is what I call a salad! I love grilled/roasted veggies. I am excited to prepare this salad after I hit the market tomorrow. 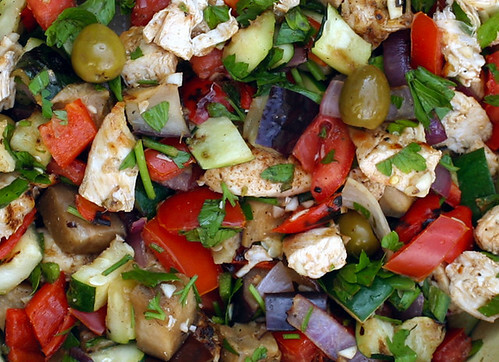 Love the name… chop chop salad! All of those roasted vegetables look so beautiful! Not to mention the yummyness that is goat cheese. Looks delicious! Oh Mary! Right up my alley – but I have never used wood chips in my grill. Time to try! This looks so lovely! Beautiful colors and flavors! YUM! That looks great. 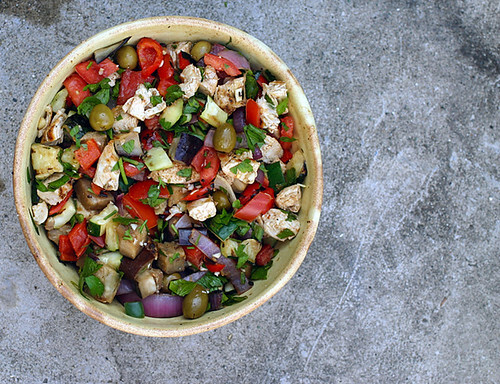 I bet it would be wonderful with shards of grilled pita bread tossed in at the last minute.